Tom, yea, I've checked everything. Even a different snap point on the frame would only move it fore or aft 1" (these are 5/4 frames), not up and down and side to side so it isn't that I don't believe. I'm 99% sure its a reproduction error at this point. Peter, I agree and it isn't really that unexpected. One of the first things I learned in the "real world" after architecture school was "never scale the drawings!" for this very reason. Dimensions are king but this set of plans sounds more like the Key Largo plans as far as that goes. No worries. I'm going to refair the longitudinals and produce a new set of frame profiles to work off of. It will pay off down the road because I think my hull design modifications can be restricted to the transom and probably the aft most 1 or 2 frames. These are exactly the sorts of issues I wanted to work out now rather than down the road when I'm ready to make sawdust. My shop is at our weekend place and while I have plenty of time at night during the week for CAD work, my weekend time is a lot more precious so I want to make that as productive as possible when I get to that point. I've got very long honey-do list and a new outbuilding to complete for I can start boat building anyway. Last edited by nybhh on Tue Oct 16, 2018 2:27 pm, edited 1 time in total. One of the first things I learned in the "real world" after architecture school was "never scale the drawings!" for this very reason. Then you've heard..."the only thing that can reliably be scaled on drawing is fish". 1) Don't sweat the small stuff, that's not the point of boat building! In the real world, you're going to struggle to measure and maintain things within anywhere *close* to the tolerances that CAD is used to. I work on a daily basis with machinists, and they spec things in thous or tenths (thousandths of an inch or tenths of a thousandth of an inch)...I always need to remind them that if I want a part for my boat, and I say "low tolerance", I mean a sixteenth of an inch. They don't even know how to spec things so "poorly"...but a 16th of an inch over a 24' hull is pretty damn precise for all intents and purposes, as Tom mentioned. As he also said, adding a 1/4" lamination isn't only quick, easy, and invisible...it's sort of part of the fun. I've messed up my build countless times (witness scrapping my entire topside finish as we speak), despite having built a boat already before this one! But one of the most relaxing, therapeutic, and enjoyable parts of working with wood at the (lack of) tolerances required is that it's so forgiving, and almost impossible to screw up permanently. What I'm really saying here is even if your CAD is dead-nuts accurate to 2 thou, there's a good chance the "real world" won't cooperate, and you'll end up making a little more sawdust than you intended too anyways. Don't sweat it - think of it as part of the fun. I do. PS, how are you planning to CNC the frames? They're generally made of multiple parts, and it's not advisable to make them from plywood...so you'd just be CNCing the joints / elbows, and then lining them up and assembling them "by hand". 2) *DO* use CAD to customize stuff! Man, I wish I'd been that good when I first went about modifying my design - I would have given the damn thing way more curve in the transom, sheer lines as they went aft, etc. I had to modify my frame profiles entirely by "eyeballing" them on the plans and patterns, which was horrifying at the time and in hindsight incredibly stupid. While I'm very lucky that it worked out in the end, I would have been able to take way more creative liberty if I'd had access to CAD to show me how things would actually look. Just my $0.02 - either way I can't wait to see this thing progress! Thanks for the advise Denon. It is very much appreciated and I totally hear you. As for the frames, I’ll most likely use white oak as that is readily available locally and I have a Woodmizer saw mill so I can mill plenty of quartersawn white oak at the 5/4 dimension specified for the Bolero very inexpensively. When the right logs come along, I’ll go ahead and mill that as it will probably take about a year to air dry down to about 15% which is recommeded for boat construction. The longitudinals I’ll probably mill and use “green” just prior to use. I'm extremely jealous you have a mill. My good friend has a mill and a planer - the kind you feed full boards through - and while I haven't managed to use the mill I've sent more than my fair share of rough sawn boards through his planer to get my finished lumber! I cut templates from particle board, fastened over sized / rough cut gussets to slightly over sized timber as laid out over the particle board templates, then traced the entire thing with an edge router bit (the one's with the bearings) so that it was an exact match. Worked very well in the end! I'm not 100% sure I'd use green wood for the longitudinals - I don't know nearly enough about wood to state either way though. For the sheer you said that you used the NURBs trough the points defined by the transverse frames or did you use the control point NURBs? i am sure you know but the control point NURBs will give you a fairer curve generally, conversely since the data you have (Body Plan) you are forced to use those lines to develop your model which as you have noted may have some error built in. The Centerline, Chine, Sheer, and if in the plan knucle lines are your control lines and they should determine the body plan and not the other way around so the effort to CAD these drawings is a little backwards. If you could use the outlines of the frames as a guide and then recreate the sheer and chine as CV curves with as few points as necessary and fair them to be reasonable approximations of the drawing then build your surfaces off of the control lines then create your own sections using CONTOUR at the same frame locations you could eliminate the error at frame 6 on the sheer or elsewhere. Also I think it may have been mentioned before but check your mold lines to make sure that your thicknesses are thrown in the right direction. If the controlling frame outline is off on the wrong side by the 5/4 that you modeled if can throw off the fairness of the curve if you are using a NURBs through a point. There are 2 curves in the picture one Magenta (Right) and one Black (Center) and the two over top of eachother (Left). These are curves constrained to a single plane (Not 3-D, though the principal is the same) For all intents and purposes from the left view we would say the curves are the same, but the curvature graph shows differently. The black curve uses the control vertex (CV) that is not constrained to the curve to determine the curve while the magenta one is constrained to go through the point in the middle. The curvature graph shows a much more smooth transition for the black line compared to the magenta one which has a slight peak in the middle. Both curves are fair and probably beyond normal tolerance but for the sake of NURBs the CV curve is easier to achieve a fairer curve in general. Regarding the use of templates to make the frames, consider this. Once the hull structure is complete, you are going to be removing a whole bunch of the exterior in the fairing process. So accuracy is important in regards to overall size and making sure the shape is generally correct. But I believe you'll spend as much time making the templates as it would take to simply trace out the frames using the patterns supplied with the plans. IN the scheme of things, making the frames is a relatively small part of the process. It's easy to get hung up on these as everyone thinks the shape is absolutely the last word, and there is no denying that you need to be accurate. But the patterns provide sufficient accuracy given that you are going to be fairing the exterior of the hull anyway. As Denon mentioned , 1/16" accuracy will be fine for these. Now this isn't to say that you should be sloppy and certainly build it the way you want to, but it's far too easy to get lost trying to prep for a build instead of actually building. Good luck and looking forward to seeing progress shots. Hey, I recognize Rhino! I completely agree that the way the first model, working frame out is a little backwards from a designer's/naval architect's perspective but that is how I had to at least begin since the only hard dimensions I have was the full scale templates. It is sort of why I wish they would still include offset tables even with the full-scale templates. I did get everything refaired and cleaned up last night and should be able to finish redrawing all the frames, notches, etc. based off the new refaired sheer AND chine lines tonight. It's very fast now that I'm familiar with the drawings and everything and I am much happier about where things are at now. What I did was very similar to what you described although I completely forgot about the contour command and that would have been much faster! That will come in very handy when I start making modifications however so thanks for that! It has been years since I've used this software (and Maya) so I'm still a bit rusty. My original template tracing curves were, as you guessed, all point control curves and quite heavy at that. I rebuilt (rebuild command) all the athwartships curves last night and was able to reduce them down from dozens of control points to 3 or 4 CVs with less than 1/16" deviation from the "original" traced curve. Everything is much cleaner, lighter and fairer now and will be much easier to manipulate when I do start re sculpting the transom and sheer line down the road. I see that you are a naval architect and really appreciate your input. Thank you very much. Please check back from time to time and let me know when you see something dumb! I hear you and completely agree, especially if I were going to build the boat as designed. Part of this is a learning exercise for me and admittedly a bit of an intellectual exercise and part of the extra effort at this point is to get a nice, tight model that I can use to make the design changes I want to make prior to building. A good "intelligent" model that is clean will make all those design revisions much easier. I'm well aware of a tendency I have towards OCD'ness though so the reminders of reality are always good checks and appreciated, thank you. Please don't hold your breath though on "real" progress shots as that is at least a year away for various reasons but I plan to use the time between now and then well! I really appreciate all of the input I have received from the community here, what an amazing group of people. I'm glad Glen tried to make this easy. Not to beat a dead horse Brandon, but remember as well that once you actually DO string your longitudinals (chines, sheer, etc), the wood won't actually follow a perfect curve - not even close, at least as far as CAD tolerances are concerned! So I agree with Carl - don't stress it, just start building! Well, once you've gotten the design the way you want it, at least. Hi all. Life gets in the way of computer builds as well unfortunately. I’ve refaired and remodeled the frames and longitudinals since my last post and am currently working on sheathing and deck framing but figured I’d go ahead and post an update. Unlike others, I was NOT able to secure permission to cut the side off our house!! However, I do have permission from Mrs. NYBHH to move forward with building a larger outbuilding/shop where a 25' boat could actually be built so I've started working on the design of that as well. I've wanted a larger shop for a while so this is really just a good excuse to go ahead and make it happen. We're going to build it as an extension off of our barn so I'm hoping the permitting/tax implications will be minimal. This project is still a ways away from becoming a reality. I am starting to really appreciate the Bolero design and it has some beautiful lines. 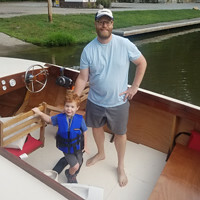 Other than some deck and cockpit modifications, I think the majority of my design modifications will be limited to the transom and as little of frames 1 and 2 as required to maintain fairness. A bit of tumblehome would be very nice but would complicate the side sheathing considerably since it was designed as a "developable" surface for a 25' long scarfed panel of plywood. I do want to finish the boat in bright mahogany so there will be some decisions to be made with regard to hull sheathing modifications anyway. Since there aren’t many Bolero builds out there to follow for more design detail, I’m going to try and relay some of the design details that one can normally get from a build thread here. The Bolero frames are all specified as 5/4 lumber, shown here 1” thick. Frames 1-5 are built with side and bottom members joined with ⅜” plywood gussets both fore & aft of the hardwood frames. Frames 6 & 7 are single piece frames, up to 8” wide. Station spacing is 30". The transom is also 5/4 lumber made up of two layers at the bottom with only the inner layer notched to receive longitudinals. The 2.25” thick Bolero stem is specified as 3 layers of ¾” plywood OR a ¾” plywood core with a layer of 4/4 hardwood on both sides of the plywood core. The Bolero Keel is specified as two laminated layers of 4/4 x 6” hardwood. The keel is straight/horizontal (parallel to the setup level) from stations 0-4 before beginning to curve up towards the stem. The keel tapers to match the stem width forward of frame 6. This view really illustrates the deep-V hull on the Bolero with its 20-degree deadrise. I do think this is a great hull design for the waters where I intend to use her. The Floor timbers are specified as 2 layers of ⅜” plywood on both sides of frames 1-5 with a 5/4 solid wood spacer that fills in the area between the timbers and frames. A single ¾” PW timber is specified for the aft-side of frames 6-8 that notches around the stem. The Bolero chine logs are specified as 5/4 x 3” and the Sheer is two laminated layers of 4/4 x 1-½”. The bottom battens are specified as 5/4 x 2-1/2”. The bottom battens are probably one of the biggest departures I’ve seen from other boat builds I’ve followed here. The frames (except for frame #8) are NOT notched for the battens and the bottom sheathing is specifically designed to NOT fasten directly to the frames. If you look carefully, the bottom sheathing is designed to not even contact the bottom frames and only makes contact with the chine, battens and keel. The reason for this is discussed briefly in Mr. Witt’s Boatbuilding with Plywood but I still don’t completely understand why to be honest although it does eliminate the need for limbers. I’m curious what other more experienced builders think about this but I’d be tempted to partially notch the frames, perhaps about ½” for the 1” thick bottom battens to help lock them into place to prevent overly stressing the batten fasteners with the understanding that the bottom frames will need to be a little thicker so the notch does not reduce their minimum dimensions. Hull sheathing could still not contact the frames and the frames could still be avoided with fasteners and limbers would still not be needed as well. Screwing or nailing to the frames themselves is a no-no on any of the designs. You don't want to perforate the planking at those stress points. I wouldn't worry about notching the frames if you don't have to. It would add needless complexity and could complicate fairing. Thanks Matt. It's easy to overthink these things!